India had suffered a 0-5 thrashing at the hands of hosts Saudi Arabia in their tournament opener on Saturday. 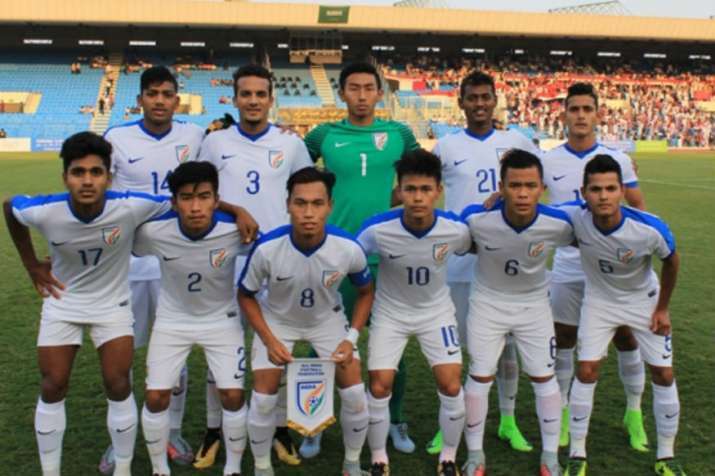 India grabbed their first point as they played out a goalless draw against Yemen in their second match of the AFC U-19 Championship Qualifiers on Monday. India had suffered a 0-5 thrashing at the hands of hosts Saudi Arabia in their tournament opener on Saturday. They play Turkmenistan in their final Group D match on Wednesday. The 10 group winners and five best second-placed teams advance to the AFC U-19 Championship Finals alongside hosts Indonesia. It was all Yemen in the first 10 minutes of the match as they dominated possession and kept threatening the Indian citadel. The Indian defence was left to deal with most of the danger, while goalie Dheeraj Singh's safe hands kept Yemen at bay. The young Indians grew in confidence as the match progressed. In the 18th minute, Rahim Ali set up Amarjit Singh whose shot from outside the box went wide. In the 29th minute, Ninthoi released a pass for an onrushing Suresh Singh, who failed to test the Yemen custodian as the ball flew over the bar. India had an opportunity to take the lead early in the second half when Rahim Ali was released onto the goal. Rahim shot straight to the goalkeeper from a tight angle in the 46th minute. Four minutes later, it was Abhishek Haldar's attempt from inside the box that went inches wide of the goal after Suresh had found him with an inch-perfect cross. In the 55th minute, Dheeraj Singh was called into action and he did not disappoint as he made an acrobatic save to keep out Yemen.